Ubuntu's goal to to present the user with a welcoming desktop environment. Although the current theme is a step in that direction, the bright colors and overly bright theme. 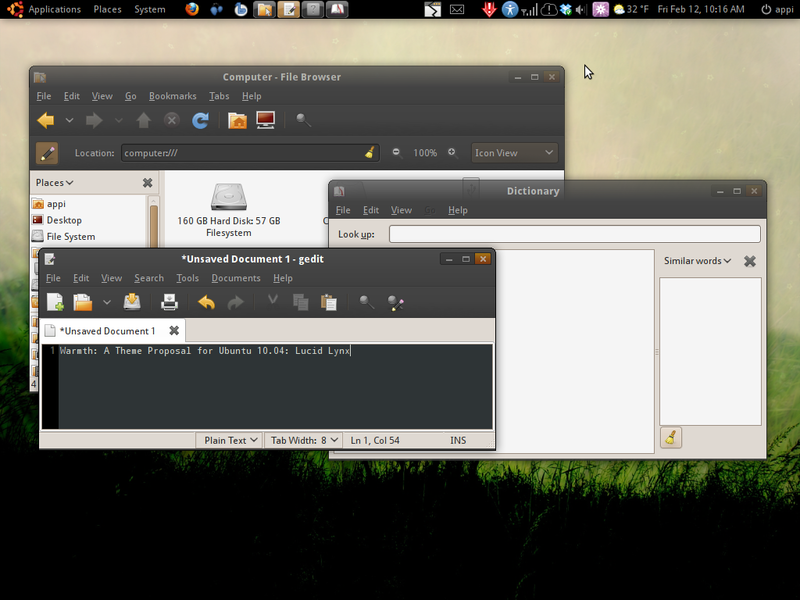 Warmth aims to be a softer, more blended theme, while still remaining within the ubuntu color scheme. Warmth uses a blend of light and dark colors to draw the eye to the content of applications. The toolbars and menubars are dark, while the body of the application is light. Also, the lower contrast on the toolbars and menubars make the text and buttons feel blended into the theme, not glaring. Instead of a shiny, glassy effect, which gives a connotation of fragility, Warmth uses gradients, making the theme look more solid and smooth. Finally, Warmth tries to use bright colors in moderation, thus achieving a dimmed look, making the theme less obtrusive. Warmth's colors are (almost) fully customizable using System > Preferences > Appearance. That is, you can customize any color except the background color of the dark parts and the color of the metacity buttons. The metacity theme that comes bundled with Warmth is a customized version of the popular Homosapien theme. 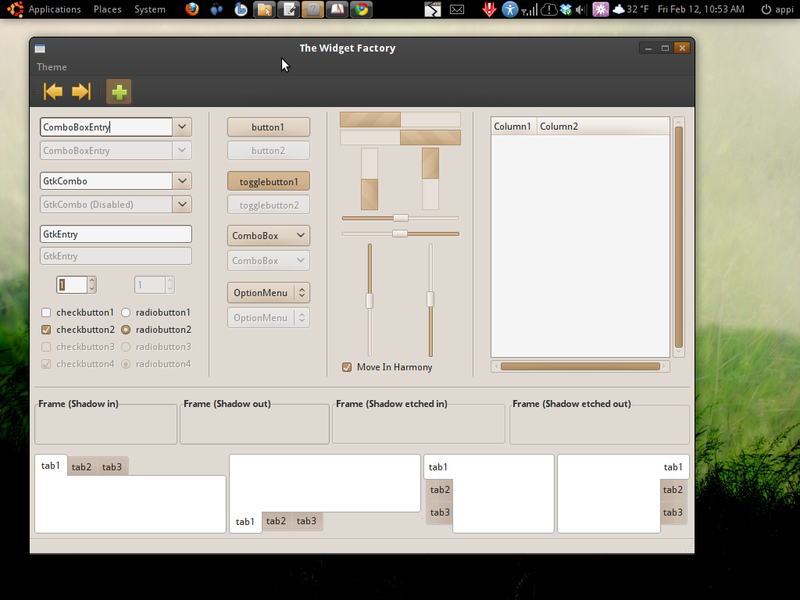 Warmth supports Ubuntu Netbook Edition as well, and themes the panel buttons to fit in with the theme. NOTE: This won't work in Karmic by default -- it needs the new version of the murrine engine. Then you can restart your computer, and install this theme. The title bar is too big. It needs to be smaller, otherwise it will never be in Lucid. The installation guide doesn’t work for me. I am using karmic. gtk-engines-murrine was not found but i could install gtk2-engines-murrine. Still the theme “warmth” does not appear. Don’t care for it. The icons look really out of place with the background. For me, the reaction is, “Yuck!” Sorry to be so blunt. Hope you can appreciate a diversity of opinion. What a ghastly mess. Dark tops and light bodies, the windows look as if they are made up of spare parts. What’s the font used in the screenshots?, it looks really nice. Who is “Warmth” theme optimized for? I prefer compact theme based on Tango. It kind of reminds me of the Dust theme (That I am using right now and love.) but the brown seems odd. I agree with Gerald and Bitterjug. It is a big mess. A big contrast of light and dark in what seems like random places. Especially the gedit window, the light colors don’t seem to belong where they are. That font looks like Droid, but that could be because the display settings are stretched (which is also why the windows seem to take up so much place). I agree though that dark themes work best in a darker environment. I can see why the developers want to stay away from silver and blues (too Windows and Mac-ey) but yellow, orange, burgundy… those would work too isntead of all those ochre and sand hues. I think Mint has managed to integrate brightness with starkness well. I’d like it if only the entire window was dark. To me the theme doesn’t look warm, it looks like cold coal that was left over from a grill. “Memory of Warmth” would be a more suitable name IMO.